Last week my students participated in the Hour of Code. It was an overwhelming success! They enjoyed it so much that they continue to code, and they continue to ask me everyday if we are going to code in class. As soon as they have any extra work time in my class, they are coding! With these amazing results, I am looking to the future. I would love to plan lessons and projects with coding involved. I only hope I have the time to prepare this for my students. They deserve it. After our Hour of Code, I surveyed my students to see if they liked coding (on a scale from 1 – 5), and if they would like to continue coding in class. The results are below. I have included some excerpts and you can also read their responses in detail here. They were emailing me their creations, so I created a “Coding Creations” wiki page where they could add things they have created (or continue to create). It was really fun to just type in all the stuff and have no clue how it was going to turn out. It was also really fun when I got home and had to figure out what was wrong in all the billion lines of code I had typed in class. After hours of work all I had needed to do was take out the commas in the character’s speech. Thanks to the Hour of Code I am ready to go back and add in more complicated things to my campaign. Computer programming is really fun, and I can’t wait to do some more. I love coding so much! I think it is so fun to watch the videos and learn how to code! I woke up at 4:30 two mornings ago to code, and at 5 the day before. I am obsessed. I thought it was really cool how you type in numbers and words, and it is linked to a little picture. I loved how you could make the holiday cards on khan academy! It was so fun! I also loved how it seemed really hard at first, but after you got the hang of it, and memorized the basic codes, you could create complex pictures. I think it is really fun to look at all the things we use computer programing for and how important it really is in modern society and then be able to learn to do it! Its AMAZING! I loved computer programming because you got a head start for the future. This has made me want to do more computer programming in the future! I did 5 because coding is fun and interactive. It may seem scary but there is a world of computer science out there and coding is one major part. I LOVE TO CODE!!!! DO MORE!! I also asked them, “What did you like best about coding?”. I liked best about coding that I could just type some letters and numbers and make what I imagined come to life! It truly is amazing. It was very cool how you really got to control your computer and that you could build anything you wanted to. I liked that it really made you think. What was so cool was that after you got the hang of it you were basically doing it by yourself, at your own speed, and what every you wanted to draw. It let your creativity flow, you could make anything you wanted with no strict deadlines. I like coding because it lets you express your self in a more complex way. The multitudes of possibilities and how simple it really is. The fact that i could create those things on a computer just by typing in stuff! The challenge and the good feeling when your character does exactly what you planed for it to do. I cannot say enough good things about the “Hour of Code” that my students participated in today. When I showed them the intro film yesterday they were so excited about coding they begged for the website link. I gave them code.org/learn. Another teacher told me that they started working on it immediately in work time yesterday. Multiple students told me they went home and worked on it last night, some for a couple of hours. I signed up on the code.org website but did not receive an email with instructions or a teacher code. I later saw that I could have the students enter my email address on their code.org page, but by that time they were very involved and I didn’t want to interrupt them to have them put my email in. Even though I would love to get a summary of what they accomplished it was not worth stopping them. The whole point of the day was to get all of my students coding. The mission was accomplished, as I’ve had several students email me the progress they have made tonight with the projects they are still working on! I’m not sure how long these tutorials will be available, but I do intend to find a way to give students class time to learn coding in the future. We have been inspired and I want to give them the opportunity to develop this skill and keep this excitement alive! The “Survey” project is my favorite project of the year because it combines technology, creativity, and collaboration. This project incorporates three different Google Documents, word, spreadsheet, and presentation (two groups even created a Google Form). The students create their own survey question and decide how to best display their data. Students also have the option to work together. My students love working with each other, being creative, and technology so they are completely engaged throughout the project. Working individually or in small groups, students created a survey question, then determined their population and their sample. I created a survey form on Google Docs that they had to duplicate, fill out, and share with me to gain approval for their survey questions. The Google Document was very useful as I could make suggestions with the “comment” feature while they were working on them. Once they had approval, they were off to collect data. I have given them several surveys over the past year using Google Forms and I was very impressed with a couple of groups that created their own Google Form to collect their data. Students created a Google Spreadsheets to analyze and display their data. They have used Google spreadsheets in my class before, but have not created their own. They first made frequency tables and then created a chart of their choice to display their data. Once their charts were created in a Google Spreadsheet, they inserted them into a Google presentation. I created a single Google presentation in which they all were to add their charts. This way, I have all of their results in one place. I love doing this for two reasons. Having all of their work in one document is wonderful on presentation day because we do not have to wait for every student to access their own document when it is their turn to present. It also makes it very easy for me to grade. A great result of this project is that I now have one amazing and creative document made by the students to teach with not only this year, but also for future years. I had the current students come up with two math questions relating to their chart(s), and the answers to the questions on the next slide. This year, students will ask the questions of their peers as they present. Next year I can use this document full of bar graphs, double bar graphs and pie charts to teach other students. My current students are very excited that I plan to use their projects to teach next year’s students. And, I believe that my future students will be more interested in the learning about these charts because they were created by students. Everybody wins! My Students were Published in Mathematics Teaching in the Middle School! We are so excited! My students’ answers to a “Solve It!” were published in the November edition of Mathematics Teaching in the Middle School. This is a national publication produced by the National Council of Teachers of Mathematics. 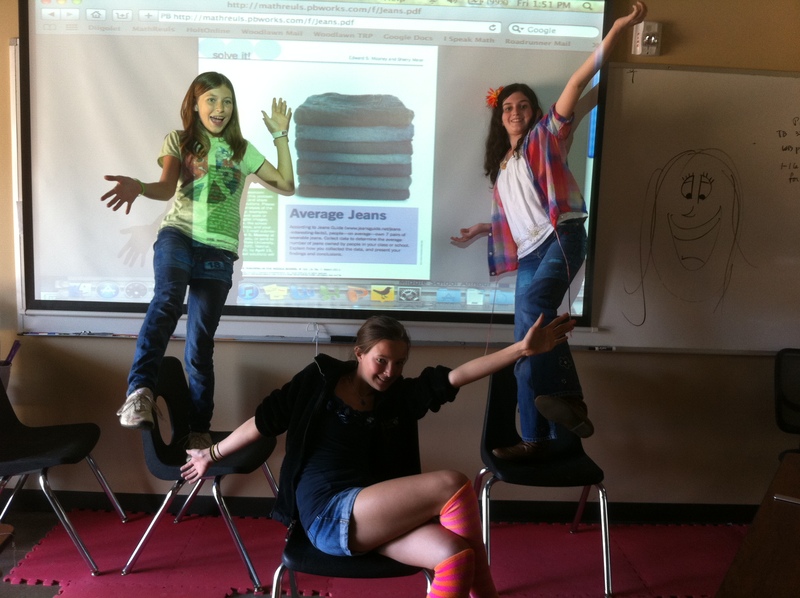 The students collected data about the number of jeans owned by every student in their class. Working in groups of three or four, they used Google Spreadsheets to compare their class average to the national average and to do further analysis of the data. They created graphs to visually present their findings. They also worked collaboratively on a Google word document to write their analysis of the data. After they came up with conclusions, they created wiki pages to present their findings. Their wiki pages were creative and beautifully formatted. They contained uploaded graphs of their data, detailed analyses, and even some pictures they took with their cameras or computers. We had already covered the unit on averages when the “Solve It!” question came about. Therefore, I gave few instructions to the students for this project. I showed them the question in the article and let them work independently in their groups. I encouraged them to be creative. They loved this project and they reported that much of their enthusiasm was due to the freedom they were given. Check out the wiki pages they created and read the Solve It! Article. Yes, apparently I am obsessed with acronyms this summer. But, when you can make them fun (WILD) and mean something great I just cannot help myself! I teach 6th and 7th graders. Middle school is their transition time. It is when they begin to grow up and become independent learners. Becoming an independent learner is a corner stone of our school philosophy. I know that this takes time and can even be difficult at first, especially for students coming fresh out of elementary school. My goal is for all of my students to move from being dependent upon me for all of their learning, to becoming independent learners. To help my students achieve independence in their learning, I am going to have designated WILD days this year. On these days I will have students start on our student created wiki help pages to access websites to work on different concepts. They can start with concepts in which they are not proficient. Students that are proficient in most concepts can work ahead so that they will not be bored reviewing concepts they have already mastered. They will keep an online WILD Log that they create using a Google Doc spreadsheet. This GDoc will be shared with me so that I can monitor their progress. I expect that helping students target what they need to work on and finding the best resources will be high maintenance at first. Eventually however, I would like the students to learn to tailor their own learning. I want WILD to be interesting and challenging for students of varying ability levels. Here is what I have for the GDocs WILD Log, but I would love more ideas on how to make the Log (or anything else) better. THERE IS NO EXISTING VERSION OF EXAMVIEW THAT WILL RUN ON AN OS X LION MAC. 1) You have a current Mac that you prematurely upgraded to Lion. At this point, accept it. There is no upgrade for ExamView and no workaround. You HAVE to go back to Snow Leopard if you have to run ExamView. If you have a Time Machine back up from your Snow Leopard days, you are set! You can go back to Snow Leopard, no hard feelings. If you do NOT have a Time Machine back-up, you will have to back up all your data (I recommend an external hard drive), erase your hard drive, re-install Snow Leopard (and all of your applications and settings and stuff) and then you are good to go. 2) You have a beautiful, brand new Mac with Lion installed. NO, you cannot put Snow Leopard onto it and NO you cannot run your ExamView. Today I was told however, that Windows 7 would run on the new Mac. So, now all you have to do is buy Windows 7, partition your new hard drive, install Windows 7 to run in addition to Lion and you are all set! What a pain! Plus, I hate all things “Windows” so this was not a viable option for me. 3) Parallels Software – Thanks to two people, a great friend on FB and an amazing educator on Twitter, I found out that you can purchase a program called Parallels that allows you to run Windows programs on your Mac. The only expense here is the program ($80) and the time. Most ExamView CD’s that come with the book include the Mac and PC installers so you should not have to purchase a new version of ExamView. This is still not an ideal option for me because I am not a Windows fan. Since ExamView is the ONLY software I need this for and an eventual fix is coming I’m willing to wait it out. However, if you have a new Mac and no other options then this may be a great fix for you. In all cases, if you have AppleCare then you are in luck, CALL THEM at (800) MYAPPLE. They will help you with software issues. The great people at AppleCare patiently walked me right through every step I needed to back up my data, erase my hard drive, and then re-install Snow Leopard. (I had no Time Machine back-up.) They also gave me options of partitioning my hard drive so that I could run Lion or Windows 7 along side of Snow Leopard. However, I decided not to do that. I am just going to run Snow Leopard until ExamView gets their act together and puts out an updated ExamView. At that time, I can just re-download Lion from the App store and then re-install. I was told that I will not be charged again as Apple has a record that I already bought it. ExamView emailed (someone more important than me) that it would be about 90 days. Right. I’ll believe that when I (don’t) see it. Whatever you decide to do, PLEASE contact einstruction. Hopefully the more people that contact them the more pressing of an issue they will realize this is. And please let them know that this is not simply an “inconvenience”. It is an unacceptable failure on their part to upgrade their outdated software. We haven’t been “inconvenienced”, we have been completely put out of service. You can also call: 888-333-4988 to speak with a technical support representative. Good luck with the fix, at least it happened durning the summer when this only made me mad, not stressed to tears as it would have if it had happened during the school year.